If you’re a seasoned anime fan, you’ll have encountered innumerable entries to the ‘high school rom-com’ genre. Many are cheap and sloppy, full of two dimensional characters and hollow drama. There’s little satisfaction to be had watching socially awkward teens dance around their emo feelings for 12-24 episodes without providing any meaningful closure. But don’t despair, because Toradora! is here to restore our faith in anime, humanity, and true love stories. First let’s talk comedy. Toradora! has it in spades. Over-the-top slapstick, snarky repartee, ridiculous reactions and visual gags are all out in force and hit you when you least expect. While the second half of the show changes focus to drama and romance over the heavy comedy of the first half, there are still great laughs to be had in nearly every episode. To this day, “Smells…like…MILK!” never fails to wreck my friends with laughter. Bravo. Still, the true worth of a rom-com is in its romance. Jokes are simpler to write than the journey between two characters falling in love in a way that resonates true with viewers. In my opinion, most high school romance anime never involves actual love at all. Typically it’s just children wallowing in various stages of infatuation and obsession, yet too afraid to act on those feelings. However, Toradora! sets the bar higher yet again with characters who confess their feelings and noticeably mature over the course of the show. The emotions they convey carry vastly more weight as viewers can relate to these well-rounded and evolving characters. Yet I reserve my highest praise for Toradora!’s presentation of true love. As I said before, ‘love’ in this genre is better labeled as infatuation. Even within Toradora! most of the romantic relationships follow that formula. However, the primary romance (beware vague spoilers ahead) is actually based on genuine love. These characters accept each other as they are instead of placing one another on pedestals. They value the other’s well-being over their own as if it’s the most natural thing in the world. With that honest love established as the basis of their relationship, the emotional payoff of their romance satisfies to the core of one’s soul. Of course, no show is perfect, and Toradora! has faults that need be addressed for this to be a balanced review and not the drool spattered ravings of a fan-boy. Especially glaring problems are a couple of events which transpired in the last two episodes. Unavoidable spoilers ahead. First, Taiga and Ryuji’s decision to elope makes no rational sense, even for teenagers. There was no threat that warranted running away from. They seemed afraid their parents would separate them and force life choices they didn’t want. However, there was no proof this was the case. They never talked to their parents even once to express their love for each other or big life choices. If they had, and the parents had been against it, then running away makes perfect sense. However, without any real threat, the choice becomes a contrived decision by the writers to add more drama for the sake of shock value. Secondly, Taiga’s choice to leave without a word to Ryuji at the end of the last episode is 100% the writers screwing with the audience. The character of Taiga we’ve come to know would never make the choice in a vacuum. Again it’s just more forced drama to shock viewers that makes no sense at all. Sorry about that for those who haven’t seen the anime yet. The short version is the writers make several decisions purely to shock viewers, but these choices make no sense and don’t have any real impact on the story. Just cheap drama for the sake of drama. Both problems could have been avoided if these plot points weren't rushed into the final two episodes but instead had time to develop properly. My other serious issue regards the three main characters who don’t end up in the final romance. They are all written to be sympathetic and relatable, and you can’t help but root for them. However, they are given absolutely no attention in the closing episodes of the show. Happy ending or bittersweet, there is nothing done to hint at their lives after high school. After spending 25 episodes with these characters, I felt a hollow ache in my gut all day after finishing the last episode. I needed a final chapter to their stories, but the writers simply ignore them. It was a huge missed opportunity and keeps the show from having a completely satisfying ending. When all is said and done, though, Toradora! is an outstanding anime, delivering almost everything you want from this genre. Each episode relentlessly attacks with the laughs and the feels and, most amazingly, tells a real love story. Toradora! ranks up there with the very best rom-com anime, and absolutely deserves your time. Why did this not have a second season? I loved this story from start to finish, I wish there was a second season. Character development is off the charts, and the humor keeps the story interesting when it starts to slow down a bit. Loved it from the first to the last episode, cannot recommend it enough. Go watch this now. This anime was so perfect, that after finishing it I felt that a little piece of myself was now missing. These characters were so masterfully invented that they felt like family. This was such a personal, honest love story. I honestly think that this was the best anime I have ever seen. A great break from my usual action shows! How can one start about Toradora? Looking from the perspective of an outsider, there is nothing truly different about this show than the hundreds of other romance anime's that have been seen already. However, my opinion quickly changed upon watching the first couple of episodes, and turned into a deep obsession by the end of the show. There are just so many things that Toradora has correct, it is easy to understand any flaws that the show may have, which trust me, are few and far between. With a flair of character that the show gives off, there are just too many perfectly blended elements that work in conjunction with each other in order to make it the perfect romance anime. The plot of the story is as follows (don't worry, no spoilers). Ryuji is a young man that finds himself entering high-school in his second year. He happens to be in a class with his best friend, Yusaku, and his crush, Minori. However, he happens to run into the most ferocious female in his school, the Palm-Top-Tiger herself, Tiaga Aisaka. They don't hit it off instantly, but when it's found out that the Tiger has a crush on Ryuji's best friend, the shenanigans ensue as they try to help each other out in going after their crush. It is true that the best wing-men are those of opposite genders. Things change slightly when they coincidentally live side by side, and at the same height (they travel often to the others house through the window), and when Ryuji learns that Tiaga can't do anything on her own, he started playing the father figure in her life, by cooking her meals and making sure she wakes up in the morning. Mmhmm, innocent father figure, right? The one bad thing I have to say about this show is that it's predictable. There aren't too many twists and turns in the grand scheme of things, but the tiny little leans that the show gives you throughout the story are enough to keep anyone entertained. By episode five, the viewers will, sadly, know exactly who will end up with who. Or so they think. The story elements are dished out in a way that is more than enough to fill anyone, but it's like a buffet when it comes to this. Each episode is filled with plot important content, so it always leaves you with hopes and dreams of what can possibly be in the next episode. I was never bored while watching the show, and I could barely wait to hit the next episode button. Even so, there is one thing that contributes to the biggest success behind Toradora. If you haven’t guessed it yet, it’s the character development. There are five different main characters of the show, being Ryuji, Tiaga, Yusaku, Minori, and Ami. Each ones personalities are so unique, that not a single one of them can get enough screentime for me. Ryuji is the chilled, “normal” one that seems to be the voice of reason, moved along with the obsession to clean everything, yet shy enough to be just adorable when trying to talk to Minori. Tiaga is a very aggressive female character that can be oh so cute when she isn’t headbutting Ryuji in the nose. Yusaku is a popular nerd that takes school very seriously, but when paired with Minori, can be very eccentric. Ami is something of a (insert vulgar language that Crunchyroll disapproves of here), but in a loving way that you’ll understand if you simply watch the show. Now for my personal favorite, Minori, who is an insane teenage girl that quite literally makes me laugh every single scene that shes in. Seriously, just look at her. She can go from being an adorable love interest to a crazy psychopath in just a single moment. Each character get’s their own little backstory, and airtime, which means by the end of the show, everyone wants genuine happiness for all the characters. Throughout the show, I found myself wanting different characters to get together. One of the female characters would do something awesome, and I’d want them to get together, only to go and ruin it whilst another stole the spotlight, so I would cross my fingers for the new contender for a few episodes. These flip-flops of emotion just emphasizes the small turns that the characters go through during their development, and as you watch the show, your feelings for them change depending on their actions. Remind you of anything? (Real high-school love triangles). Sadly, the ending leaves a little bit to be desired, but to the shows credit, or should I say credits, it wraps it up well enough. The slowest part of the show can be considered the last three episodes, but even so, I still watched them with the same amount of love that I held for the previous twenty so episodes. One of the things that really upsets me with the last few episodes is the seemingly 180 rotation in character that Taiga undergoes. I truly liked her hard exterior that she threw up in front of Ryuji, but during the end, it became very rare. It wasn’t a Taiga that I liked as much as the original, so I didn’t feel as strongly towards her advancing slowly upon her goals. But still in the end, I felt somewhat glad that everyone was, more or less, happy to an extent. Despite the weakness of the last three episodes, it was still an engaging conclusion to a spectacular story about their crazy messed up love triangle. 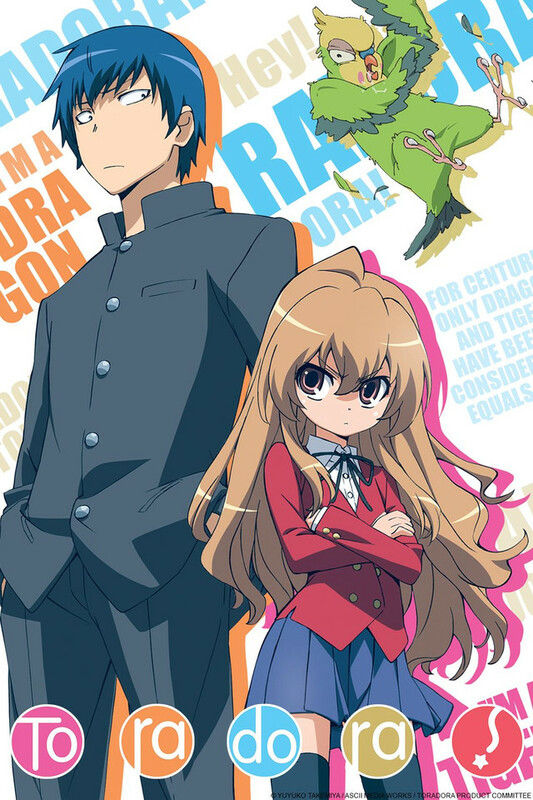 Despite the few amount of shortcomings that the show does have, Toradora is an amazing show to watch through, and easily makes it into my top 10 anime’s of all time. The predictability of the show can be countered by the small twists that occur every couple of episodes, and the characters alone are enough reason to keep coming back, even if the show didn't constantly push itself gracefully through the story line. I definitely recommend Toradora to everyone, of both genders, and all ages, for one of the most adorable, comedic, and comfortable romance anime’s on the market. I absolutely loved this show. I normally enjoy romance shows, but the depth and the dynamics of the characters really set this show apart from any I have watched before. There was a maturity to this show, and at certain places, things got really really "real". I was left somewhat unhappy by the ending, but mostly just because the show was over. YOU NEED TO WATCH AFTER THE CREDITS, OTHERWISE YOU WILL BE INCREDIBLY DEPRESSED. This show really becomes something else in the last couple episodes. Episodes 20-25 are like an incredibly different show, and it will hurt your heart a lot. I promise you will not be disappointed by Toradora. They can experience unforgettable joy and heartbreak within minutes of one another, and they are just about as predictable as a lightning strike in clear skies. However, in most media, they are rarely portrayed realistically, and this includes stories centering around them. Male protagonists have an annoying tendency to be 2-Dimensional Every-men that try too hard to seem "relatable" but just make it clear that the author has completely forgotten what it is like to be a high school student. This is not the case with Toradora. Each and every character in Toradora was made the way they are for a reason. Each and every one of them has a personality, hopes, and dreams guiding them. Though they are only works of fiction, the realism of the emotions they feel makes you hold them dear to your heart, making you care deeply for them as the series progresses. The series guides us through the joys, pains, and confusion of young love in such a realistic fashion that one could almost believe that it was a true story. Toradora is a truly beautiful story, and I highly recommend it to anyone and everyone with a device on which to watch it. If you're seeking to step back from the action a bit and take a break, Toradora is highly recommended! A perfect series for a seasonal endeavor. Although a very mushy and sappy romance genre, the series brings warmth to your heart and brings the viewer closer to the characters emotions and overall dynamic. You can relate to the characters in some ways and that is certainly what you want from an Anime. Toradora is a series that you can't just watch once. You will feel the overall emotion throughout the whole year after finishing it, making you want to watch it multiple times. A great schedule for watching it is - [Nov. 30 - Dec. 24] - If you start it the last day of November you can finish it and watch the finale on December 24, the day before Christmas! Rom-com fun - Great Anime! The only fault with this anime, is there isn't more. I love their characters so much, and loved the story! I was so sad when their story was over and I didn't have more to follow. The parrot always had me laughing too. Good watch, definitely recommend. Will not waste your time. One of the best anime that I wish it will never end. It has it's funny moments along with powerful scenes that will hit you straight to the heart because you will feel for the characters, due to the almost perfect character development between all characters. I honestly wish there is a season 2 or a similar anime :(.